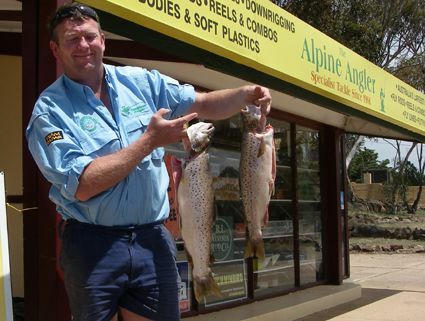 Headlines: Fly fishing in Eucumbene has been sensational over the past week. Trolling down deep is producing a few and Mudeyes for the bait fishos has been pretty good too. 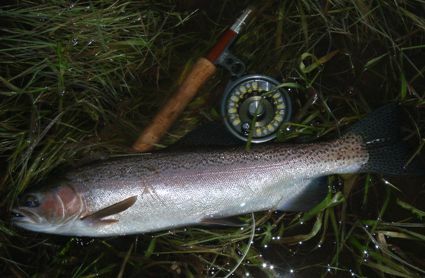 Rivers:- Have continued to fish well with plenty of fish and insects about for them to eat. Dry fly fishing has been great in most of the mountain streams and the evening rise has been very good. There have been plenty of beetles about with the warmer weather so a Geehi, Red Tag or Foam beetle are great options. Termites and Ants have also been falling some evenings so an imitation is an important pattern for the fly box. Caddis and Mayflies have also been hatching in most of the streams. 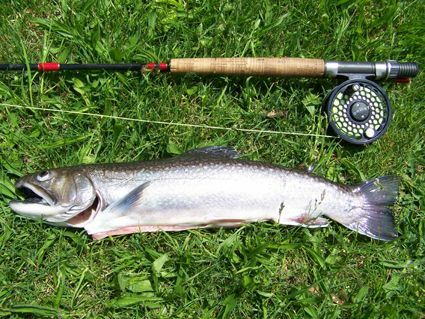 *Below, Stan Rygr from Boolarra in Victoria caught this nice Brook trout on a red tag n the Thredbo recently. A nice suprise for sure. Lake Eucumbene:- Fly reports have been fantastic overall with many anglers catching ten plus fish in a single evening session. Despite the dropping water there are midges in great numbers in some areas and have attracted in many of the lakes post spawn rainbows. Was sent this photo below to give anglers an idea of where the lake starts at Providence. *Jan Ploski and Steve Love from the South coast had a great few days hooking in excess of forty fish between them and landing twenty three fish. Only one was a brown the rest rainbows. Midge pupa and balls worked well and there were a few also taken on olive streamers. *Stuart Sturgeon had a good evening last night with sixteen fish taken on midge pupa and balls. *In another part of the lake Antony Latter landed fifteen for the evening. *Myself and Kieran O'Shannassy had good session last night too hooking ninteen between us on pupa and midge balls. 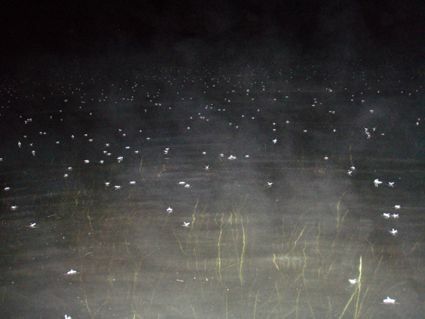 There were midge EVERYWHERE! Not seen so many fish rising in on small area for a long time. Most were only average condition but still put up a good fight and were fun to catch. Kieran landed quite a nice brown on a midge ball too. Below one of Kieran's better rainbows. Eucumbene:- Eucumbene trolling has been tougher this week. Down deep with leadcore or a downrigger is the best bet once the sun is up. Fishing in close early has been o.k. With the hot bright conditions getting lures down deep may be essential to catch fish this weekend. 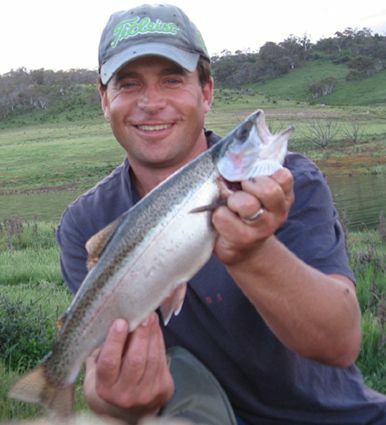 *Matthew Leonard trolled Kalkite with brown bombers and and caught two browns of 2.5 and 1.5kg and a nice 1.5kg rainbow, he also dropped one other fish. These were all caught in a twenty minute session on Saturday evening. That is nice fishing. 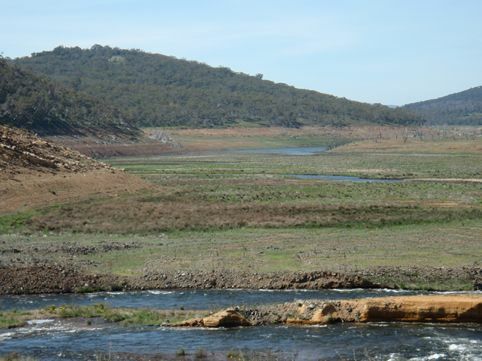 The bait fishing in Eucumbene has been fantastic and will continue with the rising water. Grubs will also be a great bait especially for browns that are starting to search the flooding bays. Orange nuggets, lime twist and lemon twist have been the best colours overall with chunky cheese gulp being a popular colour too. With the warmer weather Mudeyes have been starting to take more fish in the evenings. 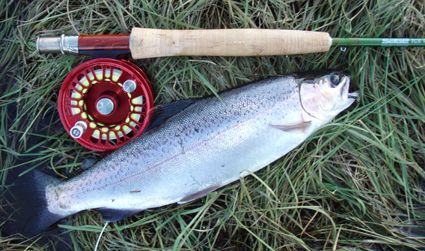 *Matthew Sturgeon caught this one last week on a mudeye. Mudeyes fished down deep in Jindabyne have been very good this week. The fishing has not been red hot for some anglers but there are still quality fish to be caught from Jindabyne.